Home is located in the very desirable Sand Dollar Beach community; away from the bar scene. This is the perfect spot for families or a romantic getaway. You will be less than 200 paces to sand and surf down our paved and gently sloping community beach access footpath. The home is a real gem; remodeled in 2018 and located just 6 houses from sand and surf. Beautiful high vaulted ceilings, magnificent giant fireplace and over 2,100 square feet of living space. You will love how bright and airy this home is; providing both large open spaces, as well as cozy nooks for private reading and relaxing. The reverse floor-plan, provides views of the ocean from kitchen, family room and master bedroom. A second 'bonus' area located downstairs provides a great escape for the children or peaceful relaxation spot. In addition, a spacious outdoor deck is a great place to relax, enjoy a fine meal at the outdoor dining table, take in the ocean view or simply enjoy the ocean's breeze. Sand Dollar Beach community is located 10 minutes from Santa Cruz and 20 minutes from Monterey. It is part of California's Manresa State Beach Coastline, close to world famous Seascape Resort, just North of Pajaro Dunes . We love this home because it is open and filled with sunshine. In addition, the beach is family friendly; it is never crowded and allows for walking miles in both directions and/or playing in the ocean. We also believe this is the best location along the coast because it provides easy access to both Santa Cruz City and the Monterey/Carmel area. complete bath, hand, washcloth. No beach towels provided. We brought our kids for 4 days of our spring break. The house was wonderful and well stocked with everything we needed. It was a nice size to accommodate our family. Joe was very responsive with any questions we had as we planned our trip and after we got there. The views of the beach were beautiful and you could hear the ocean. The walk to the beach was short. We would definitely stay there again! We traveled from out of state for a family memorial. 5 of us stayed at the LaSelva Beach house. The house was spotlessly clean, very comfortable, and had everything we needed to make a few meals, to spend time together, and to be rested and ready for our family's events. Loved the location and view and easy access to the beach. Loved the layout, and appreciated the laundry facilities and the well stocked kitchen. Would absolutely stay here again and recommend highly. Owners were easy to work with in advance, and promptly returned our deposit after our stay. Great experience! The house was even nicer than the photos! Spacious rooms, well stocked kitchen, great deck. It has everything you need. Quick walk to the beach. Great for a family or two couples. Lots of privacy. Quiet neighborhood and great location to go to Monterrey and/or Santa Cruz. Large bathrooms and every thing was super clean and fresh. We would certainly stay here again. Stayed here with my family, 3 kids, and grandparents. We all enjoyed the home. Cooked and had BBQ. All together a lovely stay! We came out for February Vacation and had a fabulous time. The house itself was clean and comfortable and well designed/laid-out for family vacations. While we did not need all the space for our family of four - it was clear that it would have easily comfortably fit a larger group including older children/adults. Lovely view from the deck and able to easily see and hear the waves. Short walk down a private path to lovely beach. With young kids one of the things that was great were the number of close playgrounds (short drive). Hidden Beach was a favorite. Lots of good places to eat a short drive (aptos) away. Close enough to Santa Cruz to easily get back and forth while still feeling well outside an urban setting and peaceful. Would absolutely come back again in the future. Great communication and rapid responsiveness from the property owner as we were planning our trip. Really good for our family, had all we needed. Other Activities: kayaking, Excellent location for a visit to Monterey Bay Aquarium one day and Santa Cruz Beach Boardwalk the next. 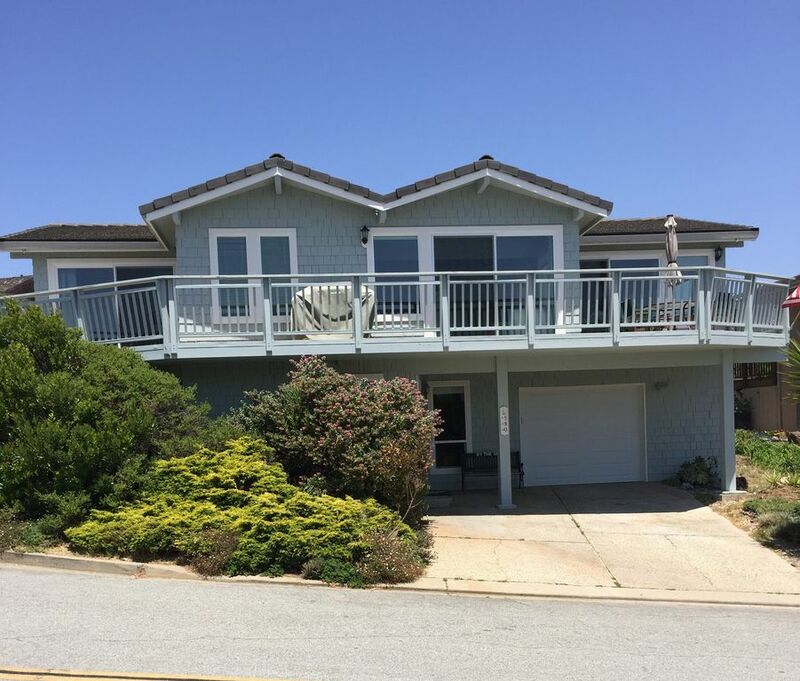 Home is conveniently located between Santa Cruz and Monterey/Carmel area.